Gospel music has been an intrinsic part of the Blues throughout the past century. This collection features Gospel Blues by such influential artists as Mississippi Fred McDowell, Charley Patton, Blind Willie McTell and the Reverend Gary Davis. Edstrom and Fox have brought new energy to these songs, presenting them with new arrangements in a modern setting, while still respecting their origins. Fox's production captures the raucous reality of Gospel Blues, coming straight from Mare's rich background not only as a formidable blues singer but also as a lifelong church musician. The skeleton tracks (drums, rhythm guitar and vocals) were recorded live directly to analog tape, as with Mare's first releases. This combination of production style and live performance gives Way Beyond the Blue a vintage feel that illuminates the vital history of authentic Gospel music. "From the opening track, it was obvious this will be a special CD. 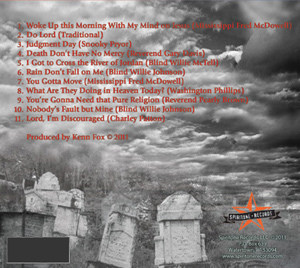 The way it mixes blues with a lot of gospel is a treat for every roots music enthusiast. With songs both uplifting and dark-sounding "Way Beyond The Blue" shows two faces of gospel music and both them are equally interesting. With beautiful arrangements and your sweet voice doing the singing this is one strong set...."
"Faithful to your style, full of energy...you add a marvellous fervor to your music. That's great, I love [it]." "...kudos has to be given for the arrangements and the approach they take on tunes written by the likes of Snooky Pryor, Fred McDowell and other masters who specialized in the acoustic genre of its presentation. While Edstrom and Fox are not a household name to blues aficionados doesn't mean they can't offer a perspective that's unique and refreshing...[Mare's] deep and throaty singing is the perfect fit for a selection of tunes that would be right at home for a church service. Having Fox handling the production chores and arrangements of the songs is a good choice. The man has a good sense of creating an ambience that makes obscure blues numbers stand out in their own way." "...Here, we are talking about very unique and fascinating blend of gospel and blues, which Mare carries with her strong and narcotic vocal...Of course, there is a distinctive guitarist Kenn Fox, and there is the great, paced rhythm section of Dave Finley (bass) and Tim Rush (drums)....Mare Edstrom's music is definitely recognized and generally accepted by many fans of gospel, blues, or just good music. Her extraordinary vocal power, energy and powerful sound effects, in any form, have yielded to the whole story, powerful and impressive sound and touch. Of course, all this resulted with her affirmation, and entering into the past, present and future giant Blues circle, which to all of us have a well-known status. Finally, to conclude, Mare Edstrom is an exceptional musician, inspired teacher, and with that she is a complete person, and to her, music and love to the music, comes first. She simply shows and proves that with her every new album...Her constant insistence and encouragement of the greatest values of the traditional musical heritage of America, is indeed undeniable. Ultimately, this is the pledge of the vibrant future for this peculiar and very special music style. And that is why it should be said a big THANK YOU to her!!!"